So, you're thinking about building a new home! This is one of the most exciting ventures of a lifetime. We've put together this step-by-step home building guide to help you understand the different building phases and how it all comes together. You'll see the whole process in one snapshot to guide you through selecting your dream house plan all the way to the finishing stages. Are you confused by all the building terms you are hearing? Do you understand your builder's language and know exactly what he is talking about when he refers to gable, cornice, water closet or hose bib? This section will help you understand all the necessary building vocabulary to know what your builder and subcontractors are talking about so that you can make informed decisions. Hiring a general contractor is probably the most important decision you will make. 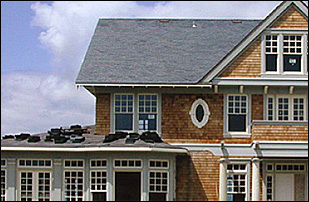 Your general contractor will not only be responsible for building a high quality house that will last for years and years, but he will also be responsible for coming in on budget, getting the house built when you need it to move in and coordinating the multitudes of subcontractors it will take to get the job done. The perfect read for anyone building a new home and trying to find the perfect home plan, Larry Garnett, a respected residential designer offers expert advice to guide you through the process.